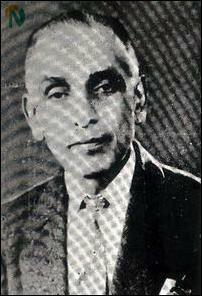 The late Mr.N.Krishnathasan, a philanthropist, leading social and religious activist of Trincomalee. "The main aim of the project is to generate a steady income to run the Sri Shanmuga Boys' Home," said the Boys' Home Committee Chairman, Mr.B.Janaranjan. The new hall has been named Krishnathasan memorial hall. The late Mr.Nagartenam Krishnathasan, a retired judicial officer from Trincomalee, founded the Sri Shanmuga Children's Home, which was located along Vidiyalayam Road, Trincomalee, in 1957. He was a leading religious and social worker. Later he established two more homes for destitute children, one at Ehambaram Road, and other at Mattikali, in the Eastern port town. Due to ethnic disturbances that occurred from the year 1977 onwards the number of children who lost their parents increased. In the 1985 ethnic disturbances, the two children's homes located at Ehambaram Road and Mattikali were completely demolished and the children who were given shelter in those homes became refugees as they had no other place to live in. They were later accommodated in the children's home located at Vidiyalayam Road in temporary sheds. As the government did not grant any assistance to reconstruct the demolished buildings, the NORAD came to the rescue of the orphans, donating 2.3 million rupees to put up a new two storied building, which is now located along Vidiyalayam Road. However, the boys continued to live in temporary sheds. The NORAD again offered financial assistance to construct a new building in a land located along Inner Harbour Road. The new building was declared open in September 1993 and it has been named Sri Shanmuga Boys' Home. 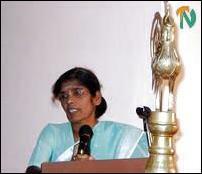 Sri Shanmuga Home custodian trustee, Ms. Vimala Nadarajah, sepaking. 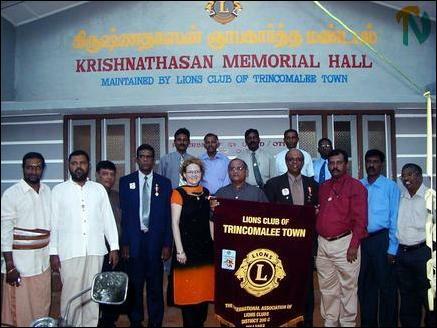 Now with the financial assistance of the USAID-OTI, the Trincomalee Town Lions Club, which has undertaken the management of the Sri Shanmuga Boys' Home, has refurbished the conference hall of the Home into an auditorium with all modern facilities and named it after the late philanthropist, Mr.Krishnathasan. Ms. Barrett said that the aim of the USAID-OTI assistance has been targeted to help the people enjoy the benefits of the current peace process and also to prevent conflict and promote peaceful change. The two year OTI programme falls under the USAID Sri Lanka Mission's Special Objective in support of the peace process with two main aims- to enhance the stakeholder support for a negotiated settlement, and to assist targeted vulnerable communities. The programme will pursue these aims through initiating community self-help activities, including the rehabilitation of small-scale infrastructure, improving livelihoods and providing skills training, encouraging inter-ethnic and inter-religious co-operation within communities, supporting increased access to balanced information, and peace related dialogue and advocacy, USAID sources said. 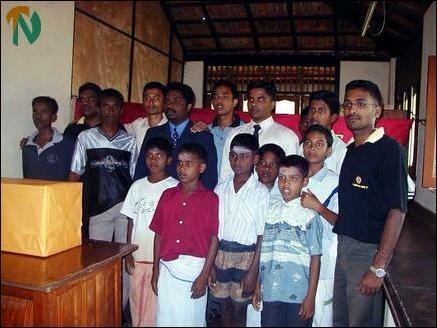 Leo Club District President Janaka Peiris and Trincomalee Leo President Mr.Kalaichelvan and other Leo members are seen with Sri Shanmuga Boys' Home inmates after presenting gifts. Lions Multiple Council Chairman for District 306 C, Mr. Ashoka Premaratne, and Lions Vice District Governor, Mr. Kassappa Mahendra de Silva, attended the event. 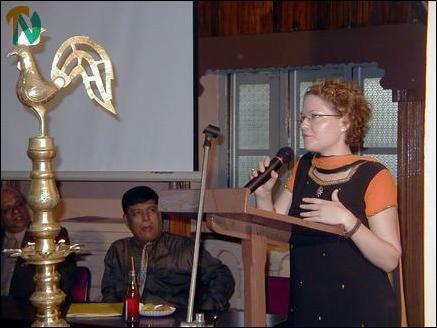 Trincomalee Lions' Club President, Mr. M.M.Jalaldeen, and Ms. N.Nadarajah of Sri Shanmuga Trust spoke. Leo District President, Mr. Janaka Peiris, presented some gifts to the inmates of the Sri Shanmuga Boys' Home. SAID/OTI Regional Programme Manager, Ms. Brenda Barrett, speaking. Chief Guest Ms. Brenda Barrett, Guests of Honour, Lion Ashoka Premaretna and Lion Kassappa Mahendra de Silva, and other officials of Trincomalee Lions' Clubs are seen in front of the refurbished building, Krishnathasan Memorial Hall.